Toddlers & Tiaras custody battle: Should Maddy Verst’s pageant mom be punished? 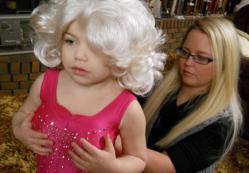 Pageant mom Lindsay Jackson put her daughter on TV in a Dolly Parton costume. Now she might lose custody for it. Six-year-old Madisyn Verst knows that a lot can happen in a year. On Aug. 31, 2011, she was featured in an episode of TLC’s Toddlers & Tiaras. Madisyn, aka “Maddy,” was filmed in January 2011 competing at the Hearts and Crowns Pageant Winter Extravaganza in Bristol, Va. The then 4-year-old Maddy won a supreme title—“0-4 Overall Sweetest Face”—and $150. The costume, featuring “enhancements,” like a fake bust and padded derriere, catapulted Maddy and her mom into the national spotlight. Together they appeared on national talk shows, like NBC’s Today and Fox & Friends. This Friday, exactly one year after her television debut, a Kentucky judge will rule on Maddy’s future relationship with both her mother and child beauty pageants. Maddy is at the center of a heated custody battle between her mother and father, Bill Verst. Things have long been tense between Jackson and Verst, who divorced about four years ago while Verst was in prison on theft charges. During that time Jackson moved Maddy to Tennessee where she lives and works; Verst lives in Kentucky several hours away, so visitation is limited. But after the Toddlers & Tiaras episode aired, Maddy’s pageant career became another battle in her parents’ war. Verst’s apprehension over his daughter’s participation on the show, and the media coverage of it, led him to return to Kentucky Family Court in an effort to amend the existing arrangements in the family’s ongoing custody case. Family Court Judge Richard A. Woeste was at least somewhat sympathetic to Verst’s concern, and ordered that Maddy compete in no more than four pageants per 12-month period. This was a big change, as 6-year-old Maddy has already won about 1,000 crowns from beauty pageants, according to a copy of the custodial report provided by Heather Ryan, manager of both Lindsay Jackson and Maddy Verst. But following a family altercation on July 4, 2012—in which Verst was arrested on multiple charges, including drunk driving and endangering a child— Judge Woeste called upon court-appointed psychologist Jean Deters to conduct a full custodial evaluation, including an assessment of Maddy’s participation in child beauty pageants. You can see that costume here. Deter goes on to detail specific cognitive and emotional consequences, impacts on physical and mental health, and sexual development that come from premature sexualization. Nonetheless the report does not propose Maddy should quit pageants entirely, because of the friends she has made through them and some of the enjoyment she feels at the events, instead suggesting she continue to be limited to four per year and not be featured in the media. But Deters does recommend that Jackson and Verst have a joint custodial arrangement, with Verst as the primary residential custodian, prompting a move back to Kentucky for Jackson. Given Maddy’s notoriety, the story quickly spread, with Nancy Grace, Dr. Drew, and Bill O’Reilly weighing in. In response to the sudden coverage, Judge Woeste issued a gag order for Jackson and prohibited Maddy from participating in any beauty pageants until his final ruling, which will come today, Aug. 31. Jackson has asserted that, within the context of pageants, costumes like Maddy’s police-officer getup and the dance moves that accompany them are not considered sexual. Having studied child beauty pageants for over a decade, I agree with her. Within that world, they are just seen as “cute,” not sexual, and are what you must do in order to win the biggest crown. They are just moves. But that shared understanding in the pageant ballroom isn’t present in the wider world, and once these routines are broadcast to a wider audience, they are rightly seen as having sexual elements in them—batting eyelashes, blowing kisses, and thrusting hips. Which is why allowing young children to be on these television shows is problematic. What is the long-term impact of participation in child pageants that may sexualize girls at such a young age, and certainly do focus on physical appearance? We all suspect negative impacts on self-esteem, an increase in eating disorders, and an obsession with perfection—but the truth is that we simply don’t know. One study that looked at a small group of former child-beauty-pageant contestants in young adulthood found that they have higher rates of body dissatisfaction, but don’t have more serious problems like depression and eating disorders. We need more of this research, though, before using participation in pageants as a basis to judge parenting, or, in the extreme, alter family dynamics. While child beauty pageants have been vilified since the 1996 death of JonBenét Ramsey for violating numerous social norms about childhood and sexuality, Maddy’s case appears to be the first public legal challenge to child pageants (though of course it is possible that other families have quietly and privately settled their differences in family courts). Even if Jackson is granted primary custody of her daughter and can continue doing pageants with Maddy, she almost certainly has had a long-term impact on child pageants, and on how pageant moms—an often unfairly vilified bunch—will think of the spotlight going forward.